Jet Towel Smart: the compact design option! The Mitsubishi Jet Towel Smart comes into its own wherever hand-drying aesthetics, convenience and hygiene need to be fitted into a compact space. As it operates without a drain tank for drip water, it is ideal for places with a high footfall and regular cleaning, like fast food restaurants, exhibition halls or sports venues. 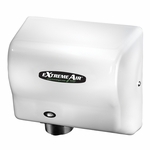 Designed as an extremely compact, wall-mounted unit, it embodies all the benefits of a Jet Towel � packaged in a body that blends seamlessly into every environment. Features: Pioneering design: With its contemporary linear design the Jet Towel Smart blends perfectly with every architectural style. Its compact dimensions ensure that it can also be used where space is at a premium. The angled surfaces on the Jet Towel Smart prevent it being used as a shelf area, ensuring that it looks smart in everyday use. Durable and robust: Specific emphasis was placed on durability in the development of the Jet Towel Smart: its robust motor is designed for many years of reliable operation. Its sturdy metal cover and fully concealed switch also help to protect it from vandalism. Cleaning and hygiene perfectly considered: All surfaces of the Jet Towel Smart have an all-over antibacterial coating for lasting and reliable hygiene and can also be cleaned using an alcohol-based agent. 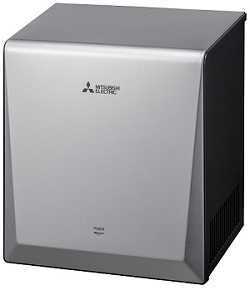 The filter can be replaced quickly and easily, and it can be cleaned without any disassembly required.